A film festival is coming to Danville and Doris Leiber, 93, is “absolutely” going. “I’m inviting everybody I know!” she said enthusiastically. 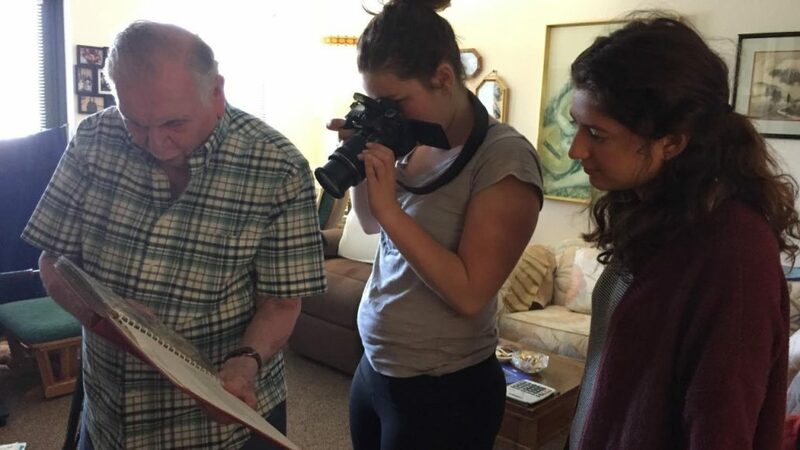 That’s because Leiber is the star of one of eight mini-documentaries about Jewish elders created by teenagers as part of the Better Together program, a collaboration between students from Contra Costa Midrasha and residents of the Reutlinger Community senior living center. The May 21 premiere at Reutlinger is the culmination of seven months of interviewing, filming and editing, but it’s also a celebration of passing wisdom from one generation to the next. “That’s kind of the beauty of it — you guys both work together,” said 17-year-old high school senior Molly Appleby. A national Jewish program funded by a philanthropist, Better Together awards grants for projects that help students foster their Jewish identity through intergenerational relationships. The program always encourages young people to meet with elders, but it was Devra Aarons, director of Contra Costa Midrasha and a former television producer, who came up with the idea of creating documentaries — partly as a way to get students interested, but also to help create a real bond. “The process is fostering the connections we were trying to create, and at the end of the day that’s what I wanted,” she said. In order to do that, the program began last September with icebreakers, getting-to-know-you events and field trips. Then the teenagers attended a weekend intensive program at StoryCenter, a Berkeley-based nonprofit that helps organizations use storytelling as a tool for social change. There they learned the basics of story creation and editing. After that, the teens and their senior partners met monthly for two months before filming up to an hour of interview footage. The kids and the elders also did activities together, such as celebrate Shabbat and visit San Francisco’s Contemporary Jewish Museum. Over the months, Lesser worked with the students, helping them edit their films down to five-minute documentaries. “I didn’t really know what I was getting myself into at first,” Appleby admitted. But the results from all of the student efforts, according to Lesser, are fantastic. “I think the audience will be impressed by the level of storytelling they’ll get from these teenagers,” Lesser said. Most importantly, everyone agrees that the teenagers and elders bonded along the way. “Our teens have really fallen in love,” Lesser said. That was true for Appleby. “I look up to her so much, she’s basically my best friend,” Appleby said of her Reutlinger partner, Henia Aitchison. Reutlinger resident Leiber agreed that spending time with her young filmmaker partner, Sydney Brandeis, was a blast. “Sydney and I had a lot of fun when we were together — at least, I did!” she said. For 14-year-old Robbie Munoz, the connection he’s made with his partner, 86-year-old Gloria Ruth, has been deep and meaningful. Learning more about Ruth’s life has given him a new perspective on his own, he said, including teaching him how to take stressful moments a little less seriously. If we don’t listen to their stories now, we might not have that chance. “They have experienced everything you have, and twice over,” he said. The students also learned something about the impermanence of life. Two elders involved in the project passed away before being interviewed, including Appleby’s original partner. “It’s very upsetting and confusing to the teenagers,” Lesser said. Contra Costa Midrasha serves students in grades 8-12, with sessions every Wednesday night at Congregation B’nai Tikvah in Walnut Creek. 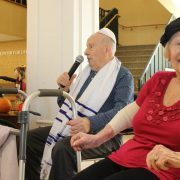 The Reutlinger Community provides health care and social support in a Jewish environment to around 180 residents. Reutlinger will host the May 21 screening, which is free with a call to the center or Contra Costa Midrasha, or online. “This is a celebration of the process and the collaboration, honoring both the elders and the teens,” Aarons said. It also honors the new relationships forged between the students and seniors during a joint project that taught a new generation to respect and cherish the hard-won wisdom of a life fully lived — a core Jewish value that Aarons said is hard to foster these days. “We need to rededicate ourselves to that value,” Aarons said. And since that is the aim of the Better Together program, by all accounts it’s been a success. “It made me realize how important and priceless your grandparents, or anyone elder in your life, is to you — and the world,” Munoz said.